Having been introduced to the James Bond series at the tender age of 10 with the release of Goldfinger in 1964, you could say I was primed early for the spy-flick craze of the era. I became totally entranced with all things Bond (still am since I’ve seen every bloody one in the series at least three times apiece). Two years later, who would have suspected I’d fall for the inevitable American remake (slash) parody that arrived in 1966. Looking back on it now 45 years later, Our Man Flint, directed by Daniel Mann, shouldn’t have worked for me. It didn’t take itself seriously and it was decidedly un-British. What the film did have going for it, though, was its clear American bent on the British spy film, writing credit goes to Hal Fimberg and Ben Starr. Plus the involvement of James Coburn as the maverick secret agent, Derek Flint. And just as importantly, American composer/conductor Jerry Goldsmith. The bevy of beautiful women sprinkled gorgeously throughout the cast doesn’t hurt either. The lanky Coburn, like many of his The Magnificent Seven co-stars of the time (Yul Brynner, Steve McQueen, and Charles Bronson, for sure) epitomized the decade’s style and cool. Plus, Jerry Goldsmith just happened to be one of the best damn music composers to ever grace a film score this side of the Atlantic. Period. Both of their contributions made Our Man Flint a minor classic in the genre, and a film that was unabashedly diverting. Even with its tongue firmly planted in cheek. It was a great example of pure 60s entertainment. Furthermore, another place in the film where his melodious efforts made a singular statement occurred during the culminating action sequence in the picture. 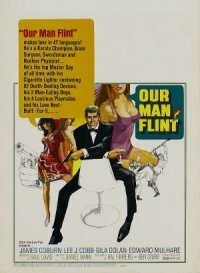 Conceivably, Our Man Flint was a satire of the action-spy movie. But it nailed its set pieces with Guy Hamilton-like proficiency. (btw, there’s a funny reference and meeting with the ‘famous 0008’ character in the plot). I should note James Coburn was perhaps the antithesis of his British analog (modeled on Sean Connery‘s interpretation of James Bond at the time) in style and looks in the film. To tell the truth, a few years later, an old girlfriend of mine (and Coburn fan) said to me, “… Coburn’s unhandsome features actually made him good-looking.” I didn’t argue. What can I say? The telltale James Coburn traits come through and make the film great. With that, he performed most of the physical demands of the sequence, including the 4-story climb up an industrial ladder — something he achieved with aplomb. The man possessed a rangy grace that became a physical trademark. In any event, what fires the sequence was the composer’s supporting instrumental piece, IMO. The You’re a Foolish Man, Mr. Flint track keenly takes full advantage of the OO7 vibe with its use of the recurring rhythmic fuzz guitar part in the melody (something Wall of Voodoo sampled years later for their cover of Ring of Fire). Along with the accustomed brass and strings accompaniment, this element totally drives the song and fuels the set’s flow with an infectious tempo. Jerry Goldsmith definitely deserves praise here for coming up with another of his splendid and energetic music creations for this film. Besides, his soundtrack realized something that should have been impossible. Mimicking and appreciating Barry’s Bond music, all the while making it distinctly his own. Trivia: in my recent re-screening of Our Man Flint , I discovered something the film had in common with a seminal actioner of the 80s. The henchman (Michael St. Clair) Derek Flint dispatches in the men’s room at the Marseille club is named Hans Gruber, which is the name (same spelling) of Alan Rickman’s character from Die Hard (1988). Excellent look at this fun romp of a film and yes, Goldsmith’s score is awesome. I really love this film also – it really evokes the fun, hip stylish side of the 1960’s and is an enjoyable satire of the Bond films. Love Coburn also. Man, he is just way too cool for school in this film. When I re-watched the film this time, my kids were included. They loved it, too. Now, after learning there was a sequel, they want to see, as well. And wasn’t Coburn just too cool in this? You can see it’s influence on the Austin Powers flicks, additionally. Good to know you’re a fan of this one, J.D. Thanks for the comment. I’ve only seen bits and pieces of ‘Flint’ on TV from time to time. Of course, I came late to Bond as well, not seeing one of that franchise until 1973. Coburn, I’ve mostly seen him playing the bad guy, and a good job of it he did, too. Oh, yeah. James Coburn reminded me of Robert Culp in that both could play the cool hero and the dastardly villain roles with equal relish. Wasn’t he fun to watch in Stanley Donen’s Charade as one of the bad guys? He was great, too, in Walter Hill’s Depression era Hard Times film as the slick character of Speed. He really showcases his hero qualities, here. Thanks, Naomi. Best Bond Rip-Off Ever. And the action scenes are quite unique in that there are no exagerrated sound effects, and the fighting style is quite raw. Good points, christian. I always loved this role for Coburn. I wish I still had turntable so I could enjoy that LP. Thanks for the comment, my friend. I loved James Coburn as a child. He was sooo cool. I even loved him in some of those old cheesy B movies that I can’t remember the names. Wasn’t he, though? He always a presence in whatever he was in. Thanks so much for your comment, Allison.